Leonardo da Vinci drew The Vitruvian Man in approximately 1487 in one of his notebooks. This world-famous drawing is also known as the Canon of Properties or Proportions of Man. The Vitruvian Man blends art and science and showcases da Vinci’s interest in proportion. It also provides an example of da Vinci’s attempt to make connections between man and nature. The drawing currently resides in the Gallerie dell’Accademia in Venice, Italy and is rarely shown. Leonardo da Vinci had a great interest in science as well as art. While the concepts of human proportion had been studied for centuries, his drawing was unique due to some modifications he made based upon his own observations. Multiple examples of anatomical sketches exist and may have served as inspiration or source material for da Vinci. However, his primary inspiration came from the work of Vitruvius, a famous Roman architect. His background in geometry and anatomy gave da Vinci a unique ability to apply geometric principles to his artwork and The Vitruvian Man provides an excellent example of his ability to blend science and art. The Vitruvian Man is a pen and ink drawing done on paper with a wash over metal-point accompanied by handwritten notes. In the drawing, two male figures are superimposed upon each other. The figures are shown with arms and legs extended in differing degrees of extension. One figure shows the legs slightly apart and the arms extended straight out from the shoulders. The other figure shows the legs moderately spread and the arms extended partway above the shoulders. In both figures, the head and torso are completely superimposed. The male figures are inscribed within a circle and a square, showing the geometric proportion of the human body. Markings upon the bodies serve to identify points used in establishing proportional measurements. In addition, the drawing includes shading and details indicating musculature and anatomical elements such as joints and genitalia. The drawing includes handwritten notes above and below the drawing. The notes are based upon the work of Vitruvius who described the human body as an example or source of proportion in Classical architecture. The text above the drawing lists specific measurements based upon the human body. In this paragraph, da Vinci inscribes some of Vitruvius’ observations and provides geometric ratios based upon the extension of the arms and legs. The notes beneath the drawing continue listing specific anatomical proportions. While the top portion provides specific measurements, the bottom listing focuses on proportions of the human body. For example, da Vinci noted the span of outstretched arms is equal to height. Each point used in determining the listed proportions are marked in the drawing and a line indicating length or dimension is included beneath the anatomical figures. 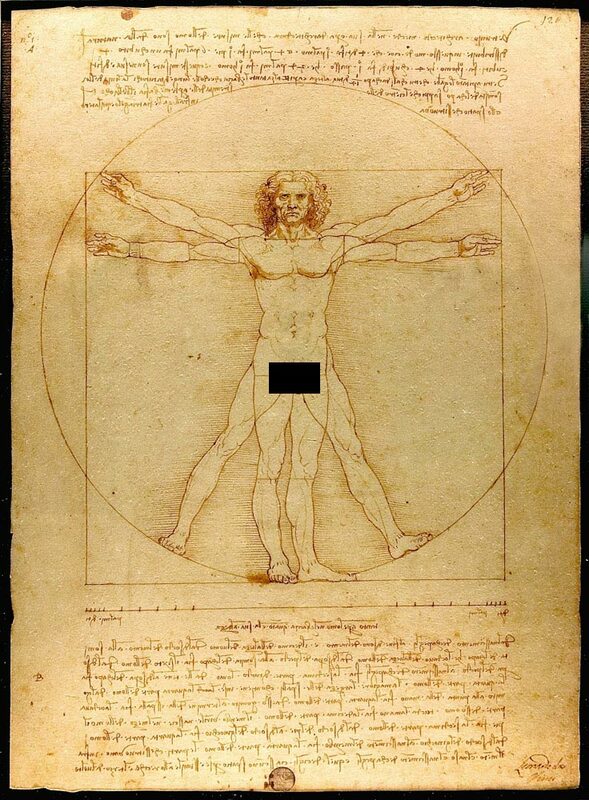 While da Vinci clearly references Vitruvius and uses his work as a basis for The Vitruvian Man, this sketch goes beyond the mathematical proportions of the human body. While Vitruvius considered the body a source of architectural proportion, da Vinci extended the observations and work by correlating the symmetry of human anatomy to the symmetry of the universe. In da Vinci’s drawing, changes to the original source material include shifts in the position of the enclosing square and variations in the height of the extended arms. These changes show a greater understanding of anatomy gained through da Vinci’s study of the human body. Although the drawing consists of two superimposed images, the combinations of limb positions allow 16 different poses to be observed. In addition to the anatomical and artistic value of The Vitruvian Man drawing, mathematicians have studied the drawing extensively and found numerous proportional rules and formulas in da Vinci’s work. The drawing aligns to an octagon, which serves as a geometric framework for the proportions of the human body. Close analysis of the drawing shows each individual proportion adheres to the canon recommended by Vitruvius and still holds up to modern medical and mathematical studies. The Vitruvian Man is one of the most well-known and easily recognized images of Renaissance art and serves to showcase the blend of art and science which emerged during this period. The drawing, found in da Vinci’s notebooks, was intended to be part of his personal notes and observations of the human body. Yet, it still continues to be a vibrant and resonant image appearing in numerous modern contexts to represent the same blend of science and art. The Vitruvian Man is the most interesting subject I have ever seen among world famous drawings. I am collecting stamps and postal material on this subject. If any one can advise me on this theme I would be highly obliged. The Vitruvian man is a drawing of Jesus (in old age) as splayed on the cross. IT also encompasses the Fibonacci rule hence 6 being the magical number hence cubit being 6 palms a cube get it??? a square it depicts geometry and the circle of life. The interconnectedness of it all. That’s what I see. Do you really believed Jesus died on the cross? He spawned a blood line….yes he had a woman read the old bible. And like those before he lived for hundreds of years… after all he was the son of God. Da Vinci was actually clearly against Christianity and the new testament. The Vitruvian Man is a tribute to the divine proportion, 1.618 to one. Sometimes referred to as the Golden Ratio. Dont believe me? The Vitruvian man is named after the man who studied this ratio the most, Marcus Vitruvius. Measure yourself from top to bottom, then divide that number by the space from the floor to your bellybutton.The answer will always be 1.618 Da Vinci knew this and thought that the human body was a living tribute to this ratio. He believed through studying this he could highly improve architecture and possibly find secrets of the human body. Take some time to google image pictures of the golden ratio (PHI). Youll be surprised what youll find. Additionally Marcus Vitruvian was an architect, explaining why Da Vinci examined the human body and its perfect ratios for that purpose. To make a sweeping statement like that indicates that you have not studied Leonardo enough. He was a very spiritual man constantly in the search to understand the universe and its make-up and origins. He definitely was not against Christianity or any other religion for that matter. He was very open-minded about any knowledge that man had accumulated, analysing it for himself and not being influenced by the type of ingrained bias and prejudice as displayed by yourself. The difficulty Leonardo had with established religions was their strait-jacketed approach to rituality and doctrines. This was too blinkered for a man of his complex mind and wide vision. He distinguished greatly between Christianity, the religion, and Catholicism, the business. He was cautious who he engaged in these debates as it was medieval times and the Church was all-powerful, dealing harshly with any who disagreed with their dictums. So much so that any disagreements would be met with accusations of heresy and Inquisition. That mighty organisation and its holy men were responsible for the deaths of hundreds of thousands who stood against their religious dictatorship. I’m sure when Jesus returns he will have a special place reserved for those who did those things in his name.You might also bear in mind that while providing the Church with some of its most iconic religious images, he also lived with the Franciscan friar and master mathematician, Luca Pacioli, in Milan and Florence for 10 years.. Strange actions for a man “who was clearly against Christianity and the new testament”. Oh and one more thing, I am not saying Jesus was not an incredible man or he hasn’t inspired millions and influenced many, Jesus was a great man and should always be referred to as such. But Jesus being the son of god was actually a vote taken in order to give him divinity and obtain more followers when other religion were on the rise. Following other votes (what day Easter is celebrated on etc.) the New Testament was born. Leonardo was concerned with “proportions” and therefore the mathematical relationship between “shapes”. Architecture, science are all encompassing. His other interest was the human body and how it functioned. His studies into the human body made of him an early anatomical genius; his “experience” with human bodies made him a scholar of the various organs, the arteries and the musco-skeletal system. The expression of each muscle as it is used in different ways,the different projections of a task being performed was Leonardo and later Michelangelo’s understanding of MAN on the physical level.The renaissance placed man at the centre of the universe therefore it is only proper that the universe is seen through him and all things are an extrapolation of him.To understand Leonardo is to feel the changes that were taking place; to understand the position of the Church-one Catholic and ever dominating man’s thought; one that one could not underestimate but to his own peril.